SCOPE member Deborah Bell-Holt testifying in front of the Strategic Growth Council this past August. This summer, our nation felt the pain of climate change more than it ever has before. From the terrifying stories of families torn apart by fatal flooding in Texas to the devastation brought by Hurricane Maria in Puerto Rico, it’s clear that the poorest, the brownest, the most marginalized in our society are hit hardest by climate change. The tragedies of this summer add urgency to the need for communities on the frontlines of climate change at the front and center of climate resiliency efforts. In 2017, SCOPE members, who live and work at the crosshairs of economic and environmental injustice, and allies fought for the prioritization of community voices in California’s Transformative Climate Communities (TCC) Program, a first-of-its-kind program that provides millions in funding for multi-strategy and place-based climate resiliency efforts. Because of the advocacy of our members and Los Angeles Equity Alliance partner organizations, SAJE, TRUST South LA, PSR-LA and the Los Angeles Neighborhood Land Trust, we were able to make the Transformative Climate Communities program more reflective of the needs of the communities it intended to serve. Together we strengthened program requirements regarding meaningful community engagement, targeted workforce development, and environmental justice indicators while removing some of the strict requirements that often create barriers to public investment in chronically disinvested communities like South LA. Only when investment is driven and continuously informed by the vision and voices of community members will it actually benefit the people that need it most. 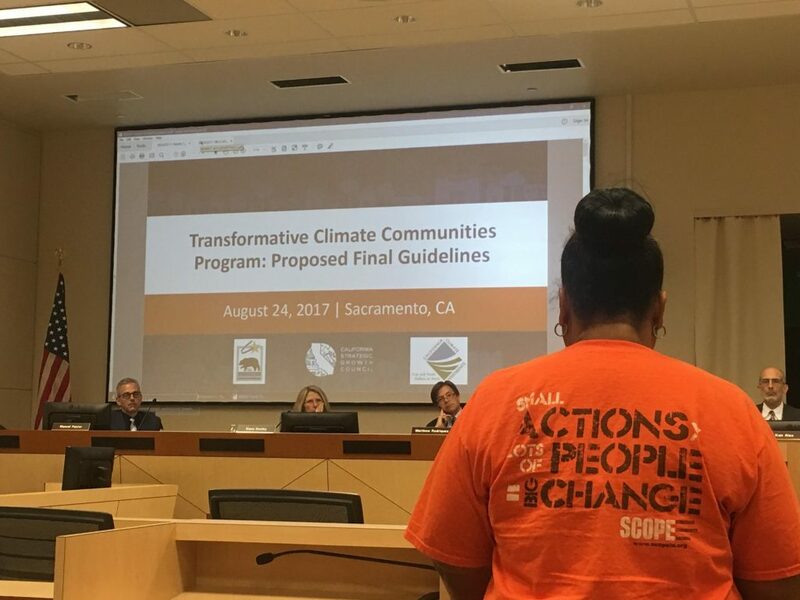 This is why SCOPE members testified in front of the Strategic Growth Council in Sacramento twice this summer about the need for community engagement in the TCC program. As a result of these and other coordinated grassroots interventions from the Los Angeles Equity Alliance, Community Engagement Plans and community involvement in decision making are now required and Community Engagement Plans are fully funded for any project seeking funding from the TCC Program, setting a major precedent for community voice in our state’s climate investment programs. Current and past industrial activity has left its mark on the physical, social, and economic health of South LA residents. Whether its toxic land left behind by former manufacturing plants or air pollution released by goods movement and oil drilling, our communities shouldn’t have to bear the devastating health impacts of polluting industries. Our members envision a new economy for South LA– one that neither harms nor pollutes, but sustains and uplifts the health and economic well being of our communities. Climate resiliency efforts, like the TCC Program, should support a just transition into economies that are safe and equitable for both workers and communities. This transition should involve the creation and implementation of pathways into safe jobs with living wages for those living and working on the frontlines. These principles and others developed with our partners at California Environmental Justice Alliance (CEJA), grounded our successful efforts to incorporate language on workforce development into the TCC Program Guidelines. Through our advocacy, we succeeded in making TCC the first cap and trade funded project that can fund workforce development programs for low income communities, thus elevating the need for inclusive economic development in climate resiliency efforts. We also won a requirement for collaborative multi-stakeholder partnerships and formalized decision-making power for community based organization and residents. There are several factors, aside from just proximity to a source of pollution, that affect a community’s vulnerability to pollution and climate change. Socioeconomic status, for example, affects how often one can see a doctor, the quality of food one can afford to eat, and other living conditions, which in turn, affect vulnerability to pollution. Therefore, tools to assess environmental vulnerability should also account for social and economic factors to account for the intersectional issues facing frontline communities. With strong support from our elected representative, Los Angeles City Councilmember Marqueece Harris-Dawson, SCOPE advocated for and won the use of CalEnviroScreen 3.0, a tool that accounts for socioeconomic indicators, like rent burden, to determine environmental vulnerability. As a result of collective advocacy, this tool, which more adequately addresses the intersectional nature of environmental justice, will be used to identify communities in highest need of TCC investment. 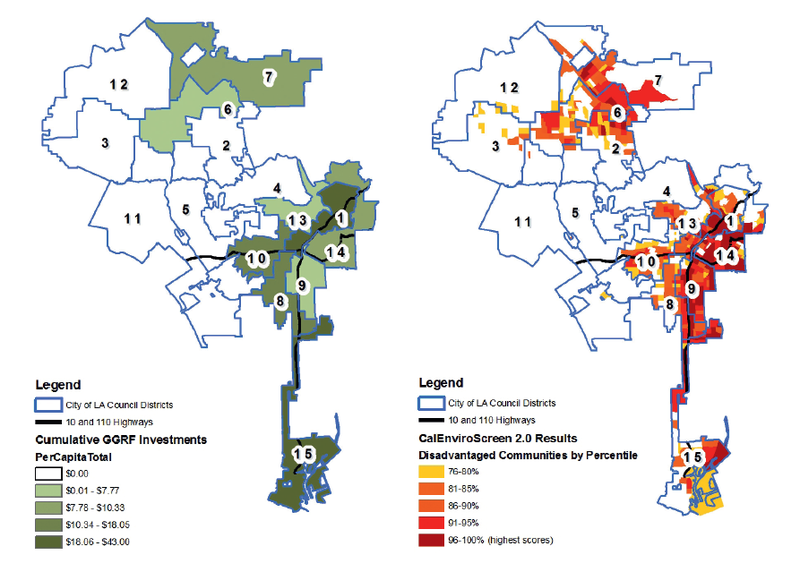 This side by side shows that in the past, climate investments haven’t adequately reached South LA’s most environmentally disadvantaged communities. This past spring, SCOPE’s research department discovered that despite massive climate investments at the state level, funds were not reaching high-need communities in South LA. By focusing our efforts on relaxing strict requirements regarding project readiness and leveraged funding in the TCC Program, we addressed some of these barriers to public investment in chronically disinvested communities. Furthermore, we succeeded in allocating an additional $10 million in the TCC Program budget for next year, ensuring the sustainability of the TCC Program well into the future.